You wouldn’t hang a small picture frame with a house nail or build a piece of furniture with an upholstery tack, but when it comes to screws most people will grab whatever they’ve got on hand to perform repairs or finish projects. Using the right screw can help you avoid trouble like loose screws, or stripping or snapping screw heads. First Lesson: Not everything with a thread is a screw. If it’s got a nut, with a flat bottom at the end of the shank, it’s not a screw – it’s a bolt! Wood Screws: Commonly made of brass, steel or bronze, wood screws are designed specifically for…wood! They’re easy to identify since most have shanks unthreaded at the top, with coarse threads at the pointed end. The screws are designed to move smoothly through wood fibers with less resistance, reducing splintering. Heads are angled -- flat, round or oval. Oval-head screws, also called “pan heads”, can be seen on the surface, but are not as highly visible as round-head screws, used in decorative applications, such as furniture design. Flat heads are utilized when it’s important to have fasteners hidden or flush to the surface of the wood. Tip: Pre-drilling holes in the wood, especially for longer screws going into hardwood, reduces the risk of snapping the head due to too much torque. Also, make sure you use the right length screw. Generally, you’ll want 1 – 1 ½ times the length of the screw to go into the adjoining board. 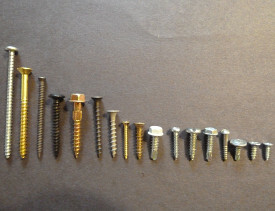 Drywall Screws: There are two basic types of drywall screws: 1) finely threaded (S-type), for attaching drywall to metal studs, and 2) coarsely threaded (W-type) for attaching drywall to wood. S-types have self-drilling tips that eliminate the need to pre-drill. With very sharp points, drywall screws go in fast and reduce tearing. There are several brands, including screws coated with ceramic, zinc or phosphate. Some coatings reduce corrosion. Charlotte house painters Paint Line make a good case for using proper drywall screws: "That small hole that seems easy to patch can quickly turn into a large, unsightly bulge on your wall." Sheet Metal Screws: Sheet metal screws, which come in a large assortment of types and sizes, can be used in any application that requires joining several different materials, including plastics, rubber and various metals, as well as plywood. They should not be used to replace wood screws but are outstanding fasteners because their sharp and customized threads guarantee a tight bond. Type A, B, or AB is the most common, while others such as Type 25 (for plastics) are used for specialized applications. Ask a hardware specialist for assistance choosing the right type of fastener for your project. Sheet metal screws may have flat, oval or hex washer heads. The latter is attached to the head to distribute force over a wider area so the screw doesn’t “sink” into the material. Self-Tapping: Self-tapping screws can be found as sheet metal, drywall or wood screws with different types of heads. They have the distinct advantage of eliminating the need to pre-drill, because self-tapping screw threads accommodate the material by drilling their own holes as they’re inserted. The disadvantages to using them are that disassembly often results in stripping the screw (remedied by using a slightly larger screw for reassembly), and they are easily snapped when over-tightened. Help! I Need a Handyman! What's Wrong With Batt Insulation?